Includes 4 figures, and 7 accessories. Product Packaging: Standard Packaging Enter the world of Star Wars and launch into action and adventure! Discover agalaxy of starships and vehicles, and get immersed in exciting stories of goodversus evil. Born from the remnants of the Empire, the First Order emerged asa power to be reckoned with in the years following the battle of Endor. TheFirst Order constructed massive fleets of next generation Star Destroyers andTIE Fighters, and bolstered surviving Stormtrooper legions with fresh recruitsand powerful new weapons. The Black Series brings exquisite features andarticulated movement, which for every devotee of Star Wars means quality andrealism. 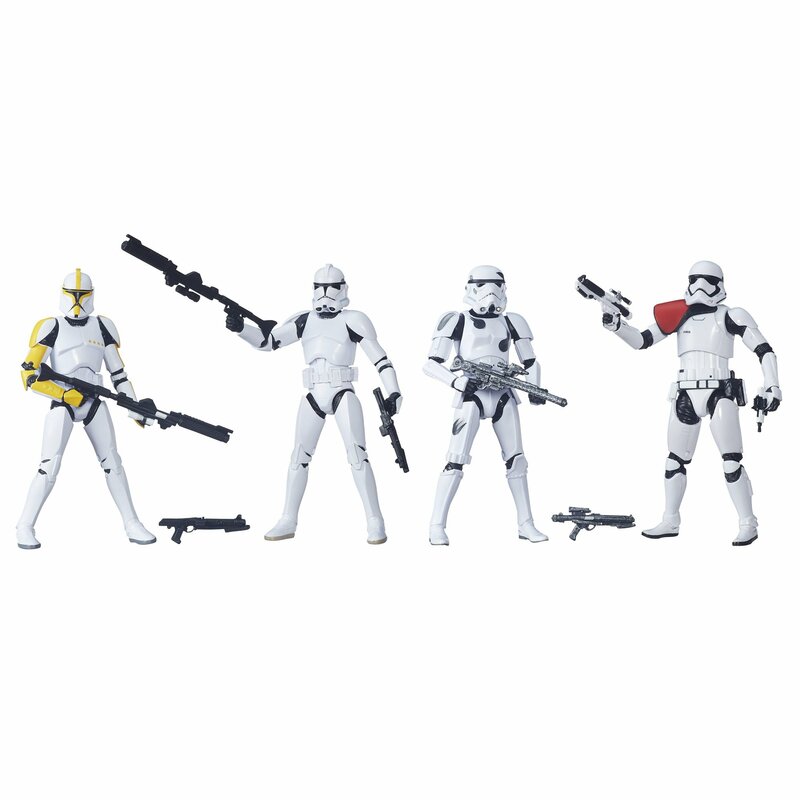 Take command with this Stormtrooper 4-Pack including Phase I CloneTrooper Commander, Phase II Clone Trooper, Imperial Stormtrooper, First OrderStromtrooper Officer. Picture new moments of adventure with 7 includedaccessories. Collect and battle with these and other figures and vehicles fromStar Wars. Each sold separately. Star Wars products are produced by Hasbrounder license from Lucasfilm Ltd. Hasbro and all related terms are trademarksof Hasbro.